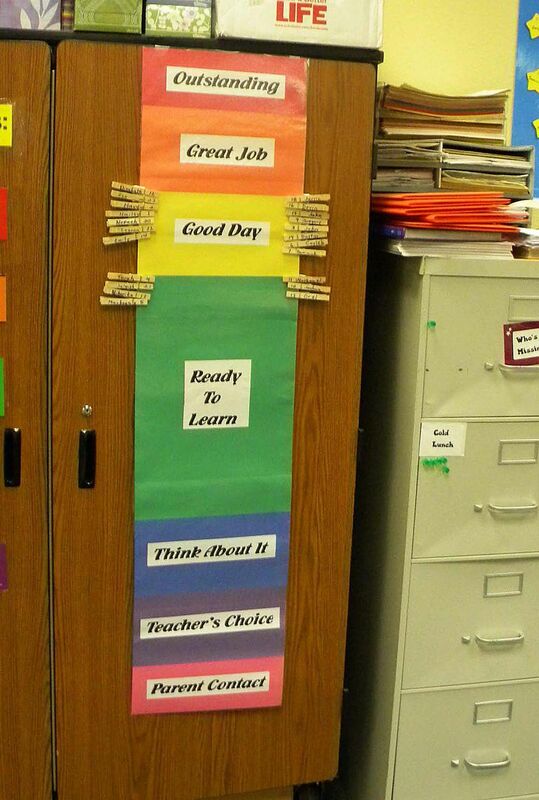 A color chart provides behavioral feedback and support classroom management. We sometimes make the mistake of interchanging the terms "behavior management" and "classroom management." The two terms are related, one might even say intertwined, but they are different. "Classroom management" means creating systems that support the kind of positive behavior across a classroom. "Behavior management" is made strategies and systems that will manage and eliminate difficult behaviors that prevent students from succeeding in an academic environment. Response To Intervention is built on universal assessment and universal instruction followed by more targeted interventions, Tier 2 which applies research-based strategies, and finally Tier 3, which applies intensive interventions. Response to Intervention also applies to behavior, though since our students have already been identified, they do not participate in RTI. Still, the strategies for our students will be the same. Consistency: Rules must be reinforced consistently, and reinforcement (rewards) must be delivered consistently and quickly. No changing the rules: If a child earns a five-minute break on the computer, don't take it away because you didn't like how they behaved in line on the way to lunch. Contingency: Students need to understand how consequences and rewards are related to behavior. Clearly define how the consequence or the reward are contingent on the classroom behavior or performance that is expected. No Drama. Delivering a consequence should never involve negative speech or snarky response. I. 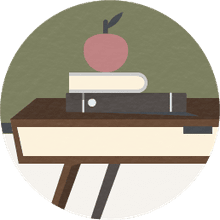 Structure: Structure includes rules, visual schedules, classroom job charts, and the way your organize the desks ( Seating Plans) and how you store or provide access to materials. Seating Plans that support the instruction that you will be using. Rows will not facilitate small group instruction, but islands or clusters may not facilitate the kind of attention you may want for large group instruction. Visual Schedules , everything from sticker charts to encourage work completion to visual daily schedules to support transitions. II. Accountability: You want to make your students accountable for their behavior as a structural underpinning of your management plan. There are a number of straightforward methods to create systems for accountability. A Behavior Chart for a Classroom. Sticker Charts to manage breaks and workflow. A Token System. This will also appear under reinforcement, but it creates a visual way for students to account for completed work. III. Reinforcement: Reinforcement will range from praise to break time. How you reinforce your student's work will depend on your students. Some will respond well to secondary reinforcers, like praise, privileges and having their name on a certificate or an "honors" board. Other students may need more concrete reinforcement, such as access to preferred activities, even food ( for children for whom secondary reinforcement doesn't work. Behavior management refers to managing problem behaviors from specific children. It is helpful to do some "Triage" to decide what behaviors are creating the most challenges to success in your classroom. Is the problem a specific child, or is it a problem with your classroom management plan? At the same time the behaviors of specific students demanded attention and intervention as well. While addressing group issues, it is equally important to address and intervene with individual students. There are a number of different strategies to use to teach the replacement behavior. Behavior management requires two kinds of interventions: proactive and reactive. Proactive approaches involve teaching the replacement, or desired behavior. Proactive approaches involve creating lots of opportunities to use the replacement behavior and reinforce them. Reactive approaches involve creating consequences or punishment for the undesired behavior. Even though the best way to create the behavior you desire is reinforce the replacement behavior, extinguishing a behavior is often not possible in a classroom setting. You need to provide some negative consequences in order to avoid seeing peers adopt a problem behavior because they only see the positive results of the behavior, whether it is tantrumming or work refusal. Social Narratives: Creating a social narrative that models the replacement behavior with the target student can be a powerful way to remind them of what the replacement behavior should look like. Students love having these social narrative books, and they have proven (There's lots of data) to be effective in changing behavior. Behavior Contracts A behavior contract will lay out the expected behaviors and both the reward and consequences for specific behaviors. I have found behavior contracts to be an essential part of success, since it involves parents. Home Notes. This might be considered parts of both proactive and reactive responses. Still, providing parents ongoing feedback and providing hourly feedback to students makes this a powerful tool to focus on the desired behavior. Consequences. A good system of "logical consequences" help teach the behavior you want and put everyone on notice that some behaviors are not acceptable. Removal. Part of a reactive plan should include moving children with aggressive or dangerous behavior to another setting with an adult to be sure that education programming continues. Isolation is used in some places, but is increasingly being proscribed by law. It is also ineffective. Time out from Reinforcement. There are several ways to administer a time out from reinforcement plan that does not remove the child from the classroom and exposes them to instruction. Response Cost. Response cost can be used with a token chart, but not necessarily for all children. It works best with students who clearly understand the contingent relationship between the token chart and receiving reinforcement.